I came across this next shortcut while making jewellery (yes I’m a Jeweller). In the process of making jewellery I occasionally sandblast different parts of a piece to achieve a frosted look. 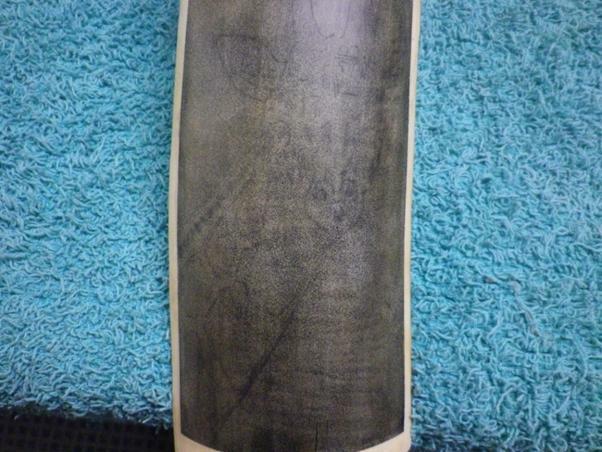 One day I decided to sandblast a piece of ivory, rub ink into it, and then wipe away the excess. I was delighted to find that it looked like it had been finely stippled. I’ve learnt a lot of tricks over the years for manipulating this technique. 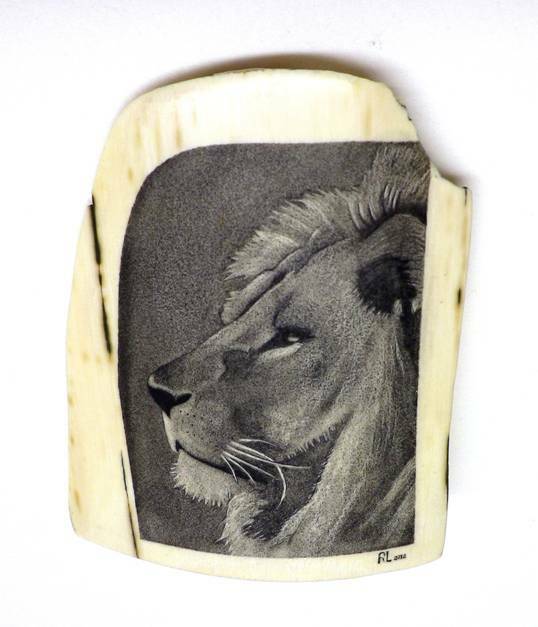 The result is a background to do your Scrimshaw on, a bit like a wash that an artist will put on a canvas before painting. If you look at my black and white work you’ll notice a boarder of white ivory around the entire piece and stippling right up to the border, just like in this picture of the lion. While it seems to work best in black and white, you can also adapt it to colour. 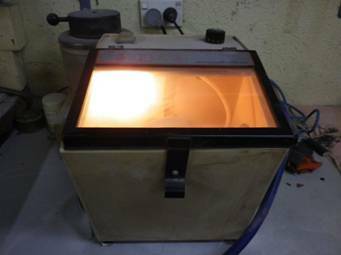 I use a Jewellers / Dental lab sandblasting machine with coarse corundum grit. Cheap sand blasters are available at Auto or Hardware stores. The bigger the machine, the better, because you want to get the ivory an even distance from the blasting nozzle or it’ll leave lines in your finished work. 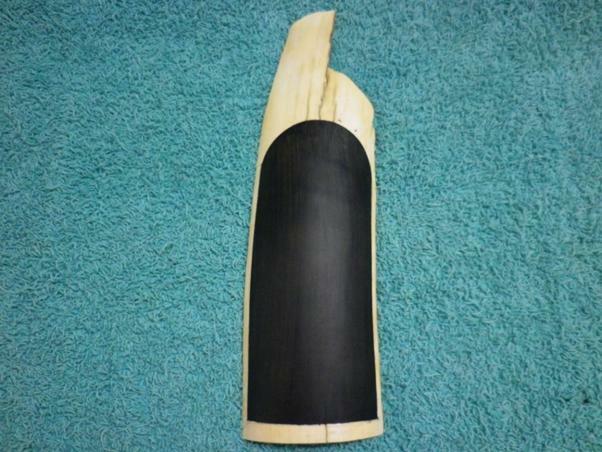 Step 1: Mask Off The Ivory To Be Scrimshawed. Sand and polish the ivory as usual in preparation for Scrimshaw. The only difference is that you just have to polish the outer edge that will show as a border. Then, I make the border by running standard masking tape around the edge where I don’t want any sandblasting. 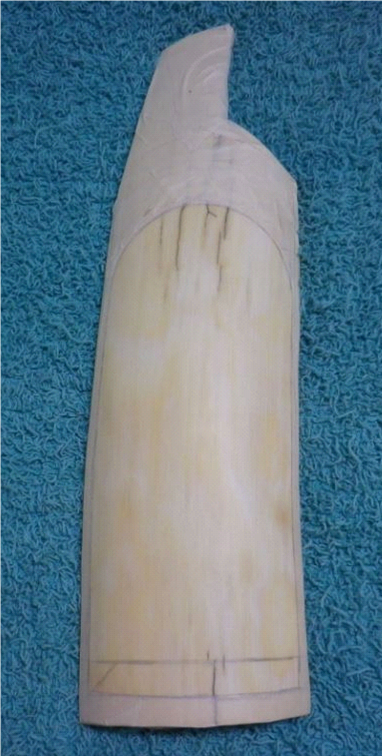 Cut the tape very fine to go around tight corners, or sandblast to the edge of the ivory. 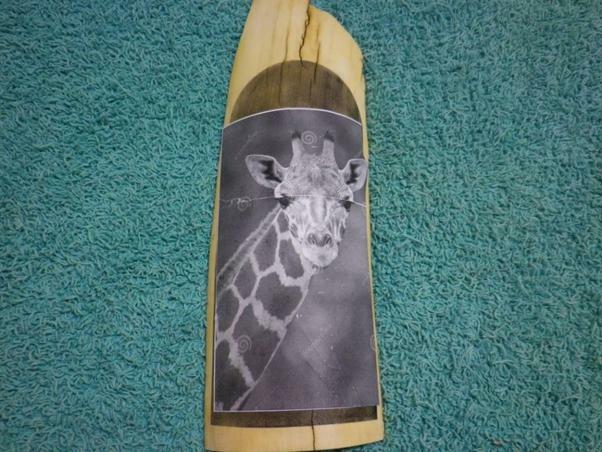 Step 2: Lightly Cover With Ink, Then Sandblast In Prep For Scrimshaw. Then I rub ink (I use water soluble ink) lightly over the ivory I’m going to sandblast. This is so I can tell when the entire surface has been blasted as there wont be any ink left. I’ve sandblasted half the ink off in this picture. 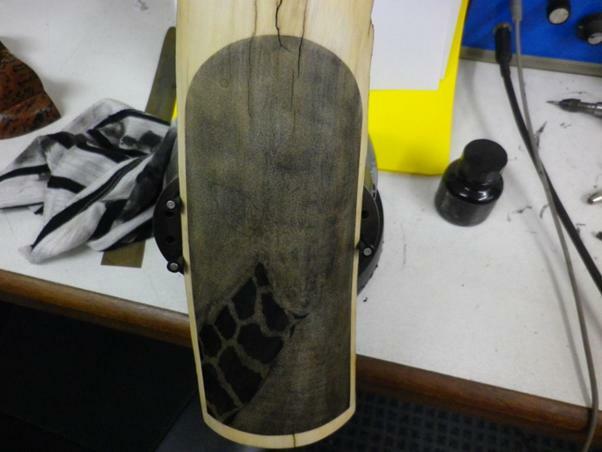 Step 3: Apply Ink to Sandblasted Surface In Prep For Scrimshaw. Then I rub the entire surface with ink. You have to do this smoothly and apply it very thickly. 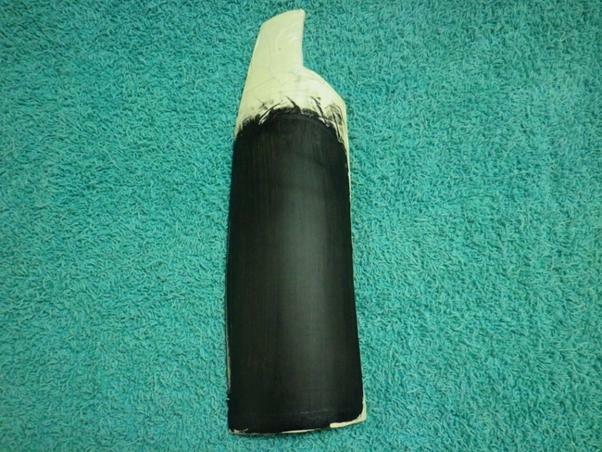 Then use a wet cloth to wipe off the excess ink. Step 4: Wipe Away Excess Ink In Prep For Scrimshaw. Then, remove the masking tape and, once the ink is dry, keep wiping the surface with a wet cloth until it is free of excess ink. You can leave extra ink on at this point – its up to you. Step 7: Cut Outline and Some Details Through Paper In Prep For Scrimshaw. Step 8: Remove Paper and Residual Adhesive In Prep For Scrimshaw. Next, fix the chosen picture to the surface with spray adhesive and cut around the outline and some detail with a scalpel. Use Shellite or something simular to remove the gum residue from where the picture was attached. 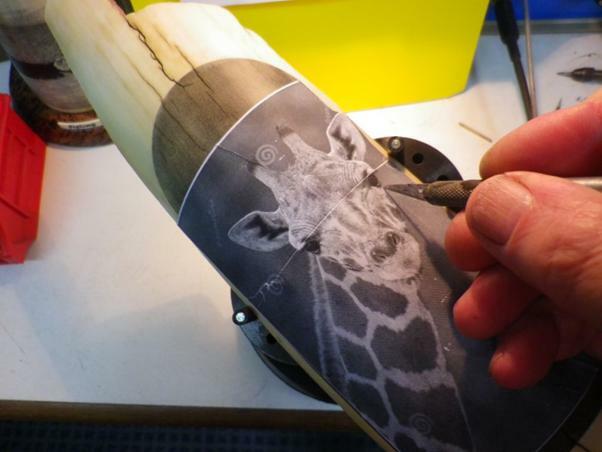 Step 9: Apply Ink to Cuts, Remove and Begin the Scrimshaw. 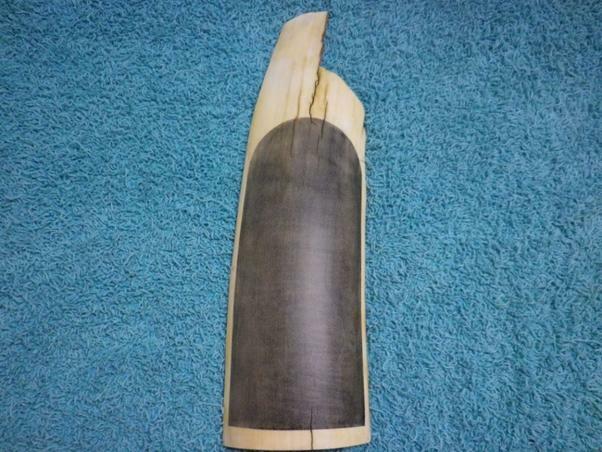 Step 10: The Finished Piece After 18.5 hr Of Scrimshaw. 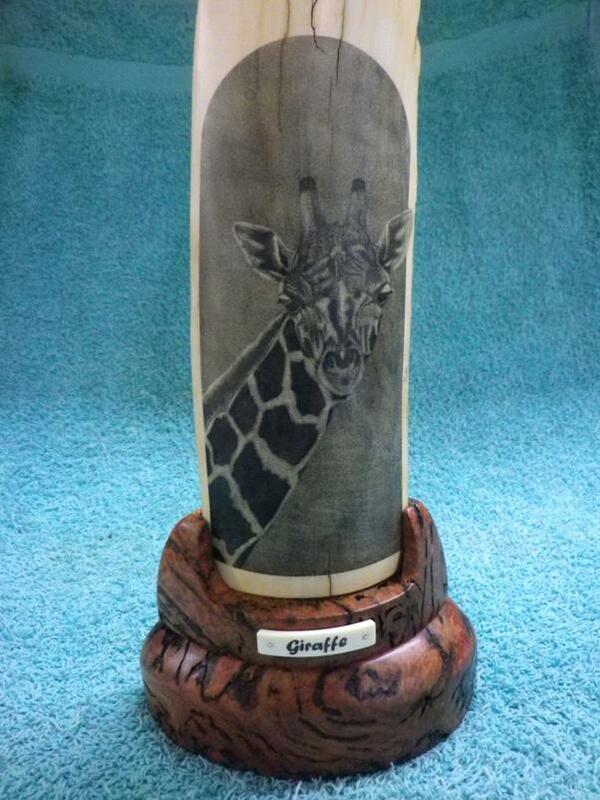 The Finished Scrimshaw: It took 18.5 hours and the base took 3.5 hours. 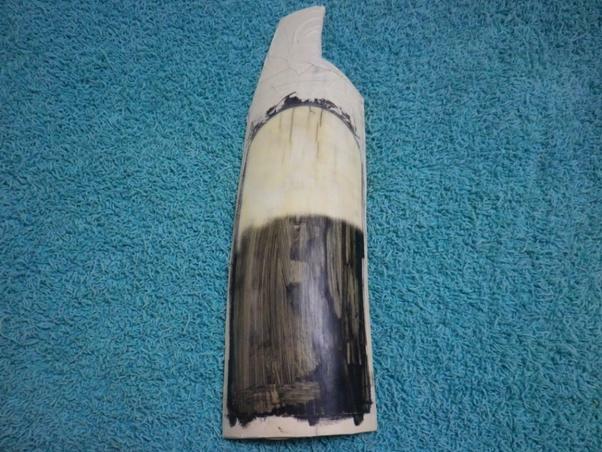 I now look for really big pieces of ivory to Scrimshaw because of Randy’s machine and the sandblasting technique. The down side to this method is that you don’t get to work in the reflection of your light, but you get used to it.